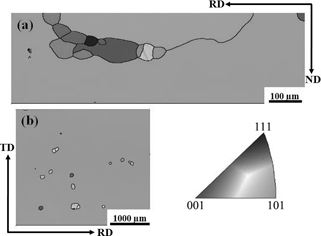 Selective abnormal growth behavior of Goss grains was investigated by interrupting secondary recrystallization process in magnetostrictive (Fe83Ga17)99.9(NbC)0.1 rolled alloy sheets. The evolution of microstructure and texture was analyzed by electron back-scattered diffraction while ramping the temperature from 1123 to 1353 K. The results indicate that before temperature increasing up to 1203 K, Goss grains had no advantages in size and quantity, and the abnormal grain growth did not occur. Goss grains grew abnormally from about 1218 K due to the inhibitory action of Nb-rich precipitates on normal growth of other orientated grains. The γ-fiber texture was the predominant texture before the onset of secondary recrystallization. When the secondary recrystallization got fully development, a sharp Goss texture and an average magnetostriction up to 210 ppm were obtained in the sample annealed at 1353 K.